I bought the Arc’teryx Rogue Pant at a very important time in my life: I really needed a pair of pants. Although I’d been on a getting-rid-of-clothing kick for the last couple of years, I needed a pair for a business trip to Jamaica - and all I had was jeans...and a couple cotton dress pants. When you’re 800 miles closer to the equator than Orlando, FL (already hot) - you want clothing that is going to breathe well. This is particularly the case when you choose - smartly - to honor the culture by wearing pants, instead of shorts (in which case, the Palisade Short & Torus Short are great options). The Rogue Pant - like various other of Arc’teryx’s - are known for their lightness, durability, and their ability to repel the elements. They turned me believer - and I now have two pair and a pair of shorts. Anytime I travel internationally, I’ll want to be taking a pair of of Rogues - or any other type of Arc’teryx. 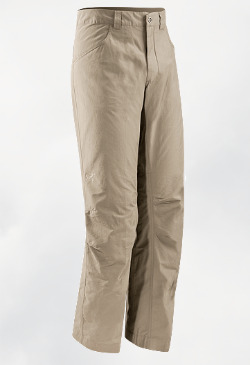 Now that the Rogue Pant are discontinued, the Rampart and Bastian Pant are great alternatives. The moral of the story is, though Arc’teryx keeps making new models of pants and closing out the old ones - they’re always stellar; able to withstand almost any type of environment.